Click for the full-size version with contact information for foreign language speakers. 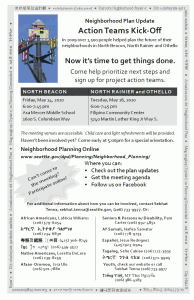 A reminder: Tonight is the North Beacon Hill Neighborhood Plan Update Action Team Kick-Off meeting announced previously in this blog. The meeting is tonight from 6:00 to 7:45 pm at Asa Mercer Middle School, 1600 S Columbian Way. There will be childcare and refreshments. If you’re not already familiar with the neighborhood planning situation, you’re welcome to arrive early; a special orientation will be given at 5:00 pm.